Years before the crisis in Flint, before the newfound appreciation across the state and nation for quality drinking water, Detroit-area residents quietly enjoyed the protection of what was considered the most sophisticated water monitoring system in America. Stretching from Port Huron to Monroe, high-tech sensor equipment first installed in 2006 provided real-time information on the waterways that serve as the drinking water source for more than 4 million people in southeast Michigan. Fourteen water processing plants on the St. Clair River, Lake St. Clair and Detroit River relied on this interconnected early warning system to detect oil spills, chemical leaks from upstream industrial plants or other contaminants flowing into intake pipes. The beneficiaries of this notification network were homes and businesses in Wayne County, the most populated areas of Macomb and Oakland counties, and portions of St. Clair, Washtenaw and Monroe counties. The largest drinking water provider involved, by far, was Detroit, with its massive grid of pipes and water mains extending many miles into the suburbs. But just as quietly as it was built, this Huron-to-Erie water warning system has been allowed to crumble in recent years as state and federal funding ran dry. Local officials in many of communities along this water corridor balked at paying for the operation and maintenance of this pollution-monitoring network. The price tag? Twenty-five cents a year. That’s the annual surcharge supporters say would have been tacked onto water bills of households in these communities to keep the high-tech monitors running once state and federal funding ran out. “It was frustrating,” said Ken DeBeaussaert, director of the state’s Office of the Great Lakes, within the Department of Environmental Quality. “People who were involved in this project felt good about seeing the government work well at all levels to cobble together this system. Budget concerns weren’t the only factor in the decision of some communities to leave the network. According to a 2012 article in Municipal Sewer & Water, a trade magazine, some munipalities along the water corridor said they were frustrated by inconsistent data, or concluded that their own monitoring equipment was sufficient and they didn’t need to partner with other communities. A 2012 attempt in the state Legislature to save the Huron-to-Erie water monitoring consortium failed. The Huron-to-Erie monitoring system relied on high-tech equipment at 14 drinking water plants, shown on this map. Computer driven, with mass spectrometers and gas chromatographs, the system analyzed water quality around the clock, sounding the alarm if it detected contamination. For 14 years, Doug Martz, who served as chairman of the now-defunct Macomb County Water Quality Board, had championed the need for continuous water quality monitoring, citing industrial dangers upstream on the Canadian side of the St. Clair River, where Sarnia’s so-called “Chemical Valley” has roughly 60 petrochemical plants along or near the waterfront. In 2002, Martz noted, more than 700 chemical spills originating from Sarnia had occurred over a 16-year period. But water plant operators on the U.S. side were often kept in the dark, which created momentum among southwest Michigan communities for a system that would sound the alarm when contaminants are detected. Then, word of more frightening spills. In 2003, during the massive blackout that hit the northeastern United States and parts of Canada, a spill of vinyl chloride, a carcinogen, by Royal Polymers in Sarnia went unreported for five days. The size of the discharge was never determined. The next year, widely dispersed discharge by Imperial Esso 1,200 barrels of toxic solvents known as MEK and MIBK, forced nine water plants on the St. Clair River and Lake St. Clair to temporarily shut down. This spill, on Super Bowl Sunday, prompted State Police to activate an emergency response center and warn the public in the affected area via cable television not to drink tap water. The succession of spills, with no sirens going off, generated momentum among elected officials for an interconnected warning system. 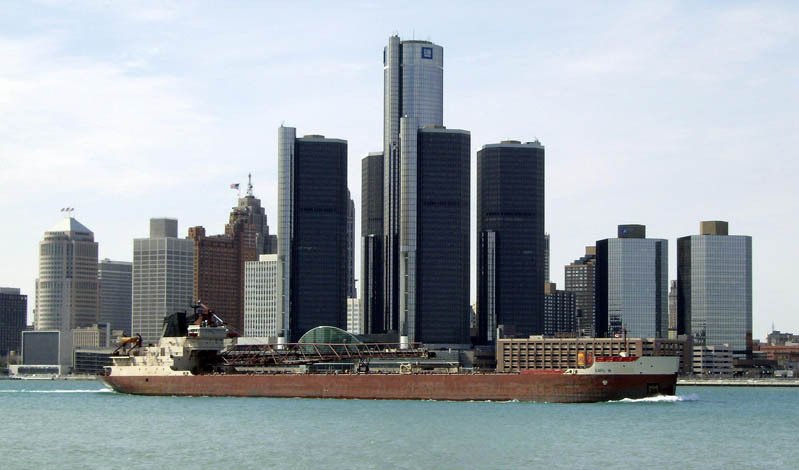 After consulting with the military, petrochemical companies and the shipping industry, metro Detroit water officials selected more than 100 contaminants they wanted quickly detected by the system’s sensors and probes, along with seven broad metrics to gauge water quality, including pH levels and water turbidity (clarity). The safety monitors were hailed as a marvel, a robotic version of the canary in a coal mine, providing continuous, real-time reports that would trigger an alarm to water plants downstream if there was a change in water quality that would allow them, if need be, to temporarily shut down. The clean-water project was also a model of transparency, providing data every 15 to 30 minutes which was quickly posted on a public website. One environmental consultant who worked on the project concluded that the approved system, largely completed in 2010, was “more robust and advanced” than the nation’s second-best network, which has protected hundreds of miles of the Ohio River for more than two decades. Homeland Security advocates liked the way the system could thwart terrorist efforts to poison drinking water. Environmentalists appreciated how the network could establish a sophisticated chemical “fingerprint,” which would be used to track down companies who clandestinely discharge chemicals or toxic wastewater into a river or the lake. U.S. Rep. Candice Miller, who played a pivotal role in securing the first allocation, nearly $1 million from the EPA, said the deterrent effect on polluters when the high-tech “pollution police” were put in position quickly became apparent. “When all these water intakes were closely monitored, what was going on with our water? All of a sudden the number of chemical spills went way down. What was that, serendipity?” said Miller, a Harrison Township Republican. The need to carefully monitor water quality is critical, as demonstrated by the tragic succession of oversights and missteps in Flint. In Flint, local and state officials have drawn widespread criticism for failing to note (and properly treat) the highly corrosive water that flowed to residents’ homes after the decision was made to switch to the Flint River as the source for the city’s drinking water. What’s more, unsafe levels of a chemical byproduct known as TTHM in the drinking water, which may have contributed to a 2014-15 outbreak of Legionnaire’s disease that killed nine people in Genesee County, was apparently due to improper treatment of bacteria in the raw river water. Chuck Bellmore, director of the Mount Clemens water plant when his city was part of the Huron-to-Erie regional system, said treating raw river water can be “tricky” because it contains a large amount of sediments, and the organic materials and chloride in the water are constantly changing. In addition, many additives used to treat the raw water are acidic and can lead to overly corrosive drinking water that eats away at lead-linked pipes. Bellmore said the high-tech monitoring system built for the Detroit area provided critical detail on water flowing in from Lake St. Clair, which guided how his plant treated the water. Supporters of the Huron-to-Erie system say the network proved its worth in July 2011 when the Port Huron water filtration plant detected dramatic changes in the pH level on the upper waters of the St. Clair River ‒ caused by discharges from a nearby paper mill ‒ and the city’s water system was shut down. Around this same time, however, two suburban county offices ‒ Macomb County Public Works and that of Oakland County Water Resources Commissioner John McCulloch ‒ opposed the network. The city of St. Clair, a key location within the monitoring network, also pulled out in 2011 following a change in city leadership. Other communities soon followed. At that point, the network was crumbling before advocates had the opportunity to make a public pitch for the minimal surcharge. The $3.2 million that initially financed the network came from the U.S. Environmental Protection Agency, the Department of Homeland Security, Macomb and St. Clair counties, and several small allocations from the state Department of Environmental Quality. But state and federal funds were temporary. There was an understanding that when the government money ran out communities would have to take over. After crunching teh numbers, advocates for the system arrived at a $1.2 million annual budget, which equated to 25 cents annually for every household and business within the network. In the end, objections to the household expense won out over the push for continuous monitoring in the event of future contaminant spills. Five cities ‒ Marysville, Marine City, Algonac and Monroe, along with Detroit ‒ continue to offer a low-level version of monitoring, keeping tabs on the basics, such as amount of dissolved materials. The most sophisticated equipment – featuring mass spectrometers and gas chromatographs -- is gone. The data is no longer logged on a website 24/7, instead it is stored at Wayne State University. And with far fewer communities participating, there remain huge gaps in what was once an unbroken chain. An 11th-hour attempt to save the full-fledged system occurred in 2012 when state Rep. Kurt Heise, a Plymouth Township Republican, introduced a bill designed to preserve the network, provide a governing structure for the 14-member group, and fund its ongoing operation with the 25-cents-per-year surcharge that would show up on residential and business water bills. Kurt Heise, R-Plymouth Twp., said he is considering pushing an effort to restore funding for the Huron-to-Erie corridor warning system. DeBeaussaert, of the state’s Great Lakes office, said he believes indifference expressed by lawmakers from the western suburbs, particularly in Oakland County, reflected their inability to connect the safety of their constituents with the protection provided by equipment located dozens of miles away. Heise, meanwhile, puts the blame squarely on Detroit, with a sprawling water system that is home to roughly 90 percent of the customers whose water was protected by the network. In 2011-12, Heise said Detroit officials began to display a bunker mentality as the city’s financial situation was deteriorating, the Kwame Kilpatrick scandal lingered, Flint and Genesee County were threatening to withdraw from the Detroit Water and Sewerage Department, and neighboring counties began to push for placing DWSD under suburban control. Early in 2012, Detroit officials agreed to provide a subsidy, an in-kind contribution of about $24,000 to keep the city’s monitoring equipment running at full capacity for one more year. But they would not budge in their reluctance to create a formal monitoring network funded by a water bill surcharge. "Where the future lies ‒ ownership of the system, cost allocations, who pays for what ‒ that's still to be decided," Rodney Johnson, a DWSD spokesman, said at the time. A DWSD spokeswoman declined to comment for this article. Given all the attention focused on drinking water quality due to the Flint debacle, Heise said recently he will consider giving his bill another try. Some officials believe the water monitoring system could be back in operation within six months if the funding issue was resolved. Jim Ridgway, vice president of Detroit-based Environmental Consulting Technology, the firm that oversaw the building and maintenance of the network, said the brief history of the alliance shows that clean drinking water is too often taken for granted. “It was very short sighted,” he said of the network collapse. “Communities are all under financial pressure and sometimes look at this type of monitoring as too costly to maintain. I would argue that the cost is small and the benefits are large. Ridgway lamented that because continuous water monitoring is not “regulatorily required,” some communities felt like they could do without it. If we just cut taxes and fees, these things will take care of themselves. Sad, sad state of affairs Michigan finds itself in today. So this is how Michigan addresses Homeland Security? And the data is stored on Wayne State University's servers? This is a real time monitoring data project - the only thing crumbling here is leadership & decision making. 25 cents per household each year is an insignificant cost for environmental protection. The attitude of the public toward their leaders makes it extremely difficult to advocate for anything. There are simply more votes for being against everything. (What's wrong with that Plymouth Township Representative who knew the danger? He didn't do enough to protect the public. He probably didn't get enough campaign donations from Consulting Technology employees.) If I practice negativity enough maybe I could get a reality TV show and run for President. Seriously, this is first rate reporting and we need a lot more of it. Lets clean up the spilled milk and quit spilling more. Crying over spilled milk doesn't seem productive to me. There is such a mentality about "free stuff" today. Nothing is free...clean water, clean air, a clean environment and the business community isn't the only entity that has to pay for it. The Detroit water system was one of the best in the nation and tasted good as well. Something to be proud of....now because of penny-wise, pound foolish decision makers we have this mess. Lets get over this "free stuff" attitude and pull together for the good of these communities....as well as dealing with the Sarnia communities. IF we want good water, everyone has to pay for it and have skin in the game. Why should residents have to pay for a water monitoring system when they don't dump or spill chemicals into the water? Hats off to Steven Gold at the Macomb County Health Department--Steve's vision, among others, embraced the importance and need to institutionalize the monitoring network. The County engaged Public Sector Consultants (PSC) to facilitate development of a governance and funding structure among stakeholders, which came to be known as the Huron-to-Erie Alliance for Real-time Monitoring and Information, or HEART. A consensus report issued in 2009 by PSC provides a framework for network administration and funding and the numbers referenced in this article. Representative Heise's comments, sadly, accurately portray the network's undoing. But let's face it--until we as a society begin to move away from this highly subsidized commodity and internalize the true cost of clean and potable water with rate payers, HEART is simply Exhibit A. A very timely, yet frightening, article. One can only hope that this wakes people up before another water disaster occurs in Michigan. There should be no question about the need to reestablish a comprehensive water quality monitoring network which would allow for critical and immediate response actions to protect the drinking water supply of many Michigan communities. I hope there will be continued reports about this unacceptable situation. Thank you. Message to governor and legislature: "You're 2/3 water, act accordingly". I would be concerned that a monitoring system at the input end of the pipe does not do it's job. The same would apply to the junction where each municipality taps into the big main. There are too many water main breaks where contaminants can enter the system, and too many places where a bad back flow prevention valve could allow bad stuff into the system. Flint is just one case where the water was tested extensively and found to contain high lead levels. Every one, in every city, township, or county that is living in a house built before 1970 is susceptible to some level of lead in their water. Sure, we have to trust that people are doing their job and taking corrective action when necessary. But no system is foolproof, and some may be affected. how did steve gold's name come into this story,he had nothing to do with raising. the funds or advocating for this system. his job was to sell this to the different communities , steve could not sell a free piece of candy or give it away, the wrong person for this job!!!!!!!!!! Why GLWA rates are going Up? Why GLWA board does not have one member knowledgeable in waterv and wastewater treatment? Why GLWA keptthe same management from DWSD? Why GLWA board should not be elected by users?